Rally East – Page 2 – The home of Rally in the Maritimes! And we’re off again! The second event in the 2017 Bluenose Autosport Club Rally calendar took place on Sunday with a RallySprint on the Ledwidge Lumber roads in Noel, Nova Scotia. 4 stages were run twice each to make up the 40 competitive kilometres of the event with a 45 minute service. At the end of the day the team of Maxime Méconse Larocque and Steve Vezina took first place followed by Jonathan Conrad and Wayne Pitts in 2nd and Cal Vandaalen and Meg Grandmaison rounded out the podium. Full results are available on the BAC website here. Coming up fast is the biggest rally event of the year for our region, the 2017 Ledwidge Lookoff Rally which will take place on August 19th-20th. Saturday will host the always entertaining spectator stages in the Conrad Bros Quarry in Dartmouth while Saturday movies to the Noel Shore where a further 80km of competitive stages will provide a challenge to teams both local and from away! Check out the website and Facebook group for all the details on how to spectate, compete or volunteer to help out! Also stay tuned for details on the upcoming 2017 Ledwidge Lookoff Rally, our biggest event of the year! 2017 Rallye Baie des Chaleurs results! The dust has settled, the post Rally hangovers have begun to wane and the stories, photos and videos of another Rallye Baie des Chaleurs start to appear online. The 40th Anniversary of this storied event showed why, for many, Rallye BDC is one of the Premiere Rally events in North America. Conditions for this year’s rally were highly variable with the fast, technical roads changing from dry, to rough to muddy in the spam of feet keeping teams on their toes. Local competitor Mal Swann returned to New Richmond, this year as co-driver to Sumit Panjabi in an open class Mitsubishi EVO X where they set a blistering pace. Panjabi is quoted as saying the BDC stages are ‘The fastest I have ever driven this car’. Minor incidents didn’t stop the team from securing a very respectable 10th overall, 8th in Open 4WD class. Also showing extremely well was Tim DIne calling the notes for Quebec driver Patrick Rainville came right behind in 11th place, 9th in Open 4WD class. Dine competed at the Baie in 2017 as Co-Driver for local competitor Jonathan Conrad. James Whitman and Daphne Sleigh did not fare as well, unfortunately. 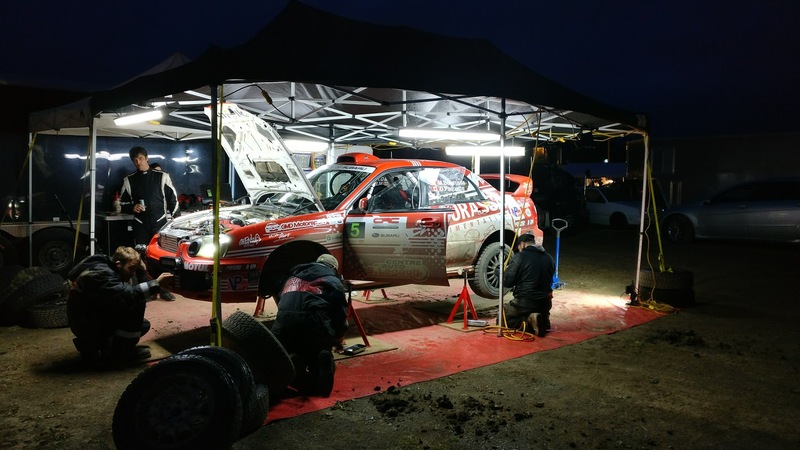 After consistent and solid performances on Stage 1-5 the local veterans unfortunately joined the ranks of the many rally teams who have found out just what’s in the roadsides of the Baie’s stages after leaving the road on SS6. Both were unhurt but were unable to continue. Both are already considering a return in 2018. Full results are available on RallyScoring.com. Photo galleries and other media will soon be available on CDNRally.com and where all Canadian Rally news can be found! 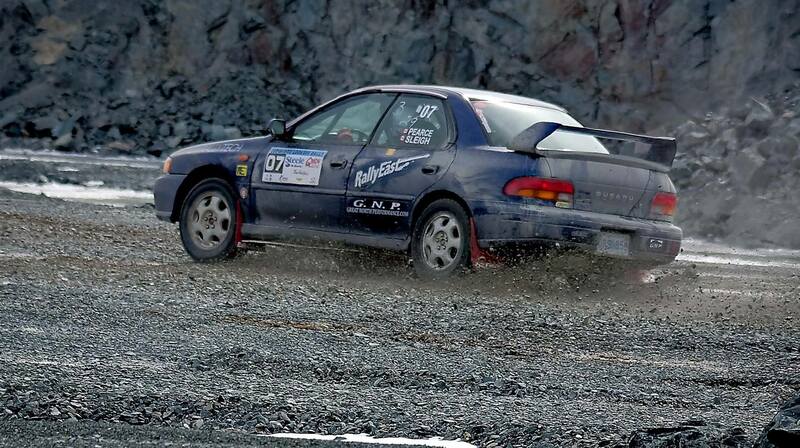 Rallye Baie des Chaleurs this weekend! The second event of the 2017 Canadian Rally Championship takes place this Saturday and Sunday in New Richmond, Quebec and several local competitors will be there! #35 James Whitman and Daphne Sleigh will be making their first run at the roads of the Baie competing in the regional portion of the event on Saturday with their 1995 Golf and its new can’t-miss-it livery! #27 Patrick Rainville takes along local co-driver Tim Dine, returning to the Baie after his first time there in 2016 co-driving for Jonathan Conrad. They’ll be competing in an open class 2001 Subaru Impreza. #12 features veteran local Co-Driver Mal Swann, co-driving for Sumit Panjabi in an open class 2009 Mitubishi EVO X. Mal competed in 2016 as a driver in his vintage RX7 but has proven he’s equally good in either seat! You can follow along with LIVE tracking during the rally Saturday and Sunday with our friends at http://live.cdnrally.com! Good luck guys! Rally Rally Rally! I might have a decal problem! Even more decal styles now available as well as some special limited edition magnets! The Rally Spring Break is over and its time to get out the gear, gas up the cars and mount the tires, the Summer 2017 Rally Season has already started! The first Navigational Rally of the season took place on Sunday, June 11th with the BAC Bluenose Rally. Starting and ending in Windsor, Nova Scotia, this annual rally tradition challenges teams new and experienced alike to some of the best driving roads in Nova Scotia… just kidding, a lot of them are pretty rough, but that doesn’t spoil the fun! Seven teams competed at this years event with long time teammates Chris Ward and Mark Grandmaison taking the tops in Experienced class while first time father and son pairing of Umberto and Ben LoPresti took the win in Novice. Full results can be found here! A photo gallery from the event by perennial photographer Harold Merklinger can be found here. After starting off the 2017 Performance Rally calendar early this year with February’s opener at Conrad’s Quarry, BAC Performance Rally Championship resumes on July 27th in Tennecape, Nova Scotia! The second of four events in the series will challenge drivers from all over Nova Scotia on some of the best rally roads around. Volunteers are always needed, so be sure to check out the Bluenose Autosport Club website and the event’s Facebook page to learn how you can help out! And don’t forget the 2017 Ledwidge Lookoff Rally is coming fast! This year’s event is guaranteed to be spectacular with new local cars and a number of out of region teams lining up to tackle our amazing stages! Stay tuned! 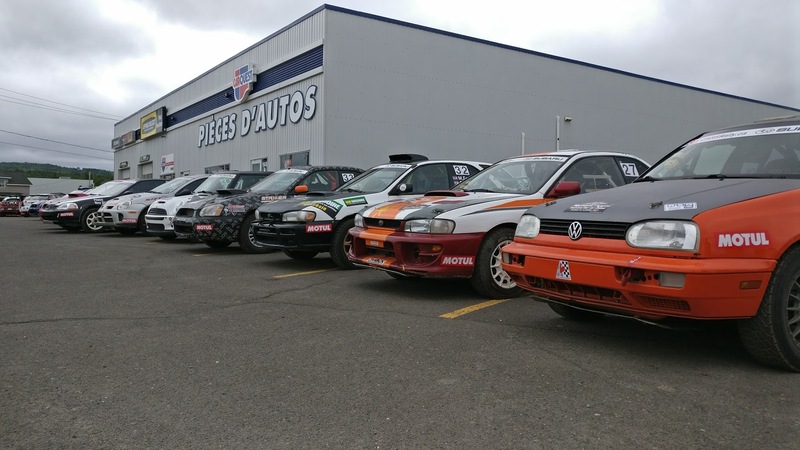 In July, a contingent of Atlantic region competitors, spectators and volunteers will be headed for the storied stages of New Richmond, Quebec for the Rallye Baie des Chaleurs, the second round of the Canadian national Rally Championship. This year marks the 40th running of this famous event and will provide some of the best rally spectating anywhere in North America. 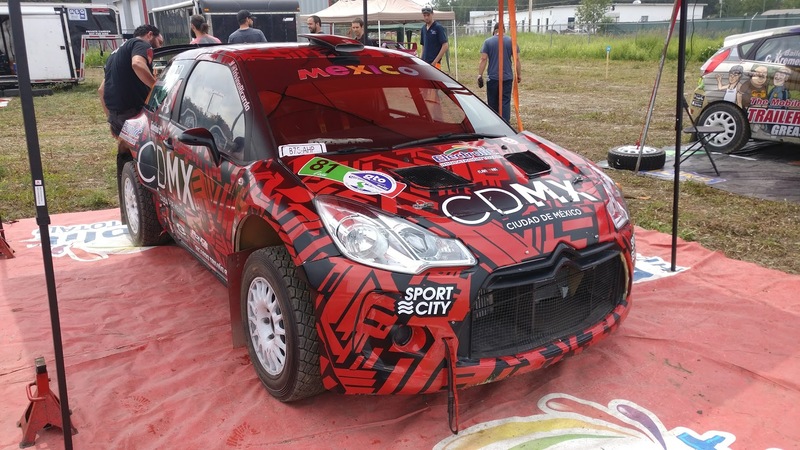 As part of numerous Rally Championships including the Canadian Rally Championship, the NACAM Rally Championship and the East Coast Rally Championship BDC will draw competitors from all over North, Central and South America! Local competitors include James Whittman and Daphne Sleigh, competing at Rallye BDC for the first time, and Tim Dine, a veteran co-driver at the Baie this time sitting in the right seat for Patrick Rainville. Good luck to all! Stay tuned to the Rally East Facebook Group for the best ways to keep track of all the rally action from afar or even better come to New Richmond to cheer on our teams in person! 2017 is going to be an amazing year for rally in our region with more events, bigger events and all the rally excitement you could want! Rally rally rally! 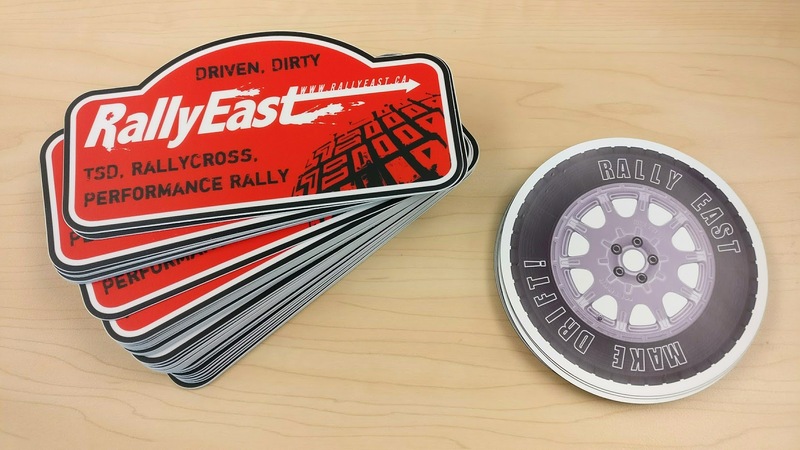 A limited number of Rally East decals are available for purchase including 28″ Windshield banners. Banners are $10/ea, smaller decals are $5. Contact me if you’re interested! Spring has typically been a slow season for rally in our region. The winter RallyCross season finishes up in March and people start looking towards warmer weather pursuits. Some are preparing their Performance rally cars for the upcoming season and still others are patrolling the back roads of Nova Scotia looking for the best ones to use for Time/Speed/Distance Rallies. On Sunday, June 11th the annual 2017 BAC Bluenose Rally will take place which will start and finish in Bridgewater, Nova Scotia. This Time/Speed/Distance Navigational rally is open to everyone of any experience level. All you need is a street car, a friend, a pencil and a watch! Teams set off at 2 minute intervals with instructions that they must follow at specific speeds and timings in order to reach hidden checkpoints. Penalties are assigned for each minute early or late! Its a great, low contact way to get a feel for the accuracy and teamwork of rally in a safe environment! This is a very Novice friendly event with easy to follow instructions (but hard to master!) and a quick First-Timer school session will take place before the event. For more details, schedules and how to enter be sure to RSVP via either the ARMS Forum or Facebook! The Atlantic Sports Car Club has limited edition commemorative posters for sale. The posters are high quality reproductions of the event poster for the 1962 Valley Rallye and would great on any rally enthusiasts wall. Only 55 posters have been made and they won’t be reproduced again so get yours now! Posters are $40, please contact Brian Jarvis at treasurer@ascc.ca to get yours! And we’re done until the fall! The 2016-2017 Bluenose Autosport Club RallyCross season was a resounding success with huge turnouts at every single event and thankfully very limited weather problems throughout. The season was capped off with another spectacular day at the Conrad Bros Ltd Quarry in Dartmouth, Nova Scotia. Full results from the season broken down by Overall, Class (Including Spec Yaris/Echo!) and Novice class can be found on the Bluenose Autosport Club Website here. As a final send-off to the season BAC will be holding a RallyCross social dinner and awards presentation this Sunday, April 9th at Freeman’s Little New York in Sackville, Nova Scotia at 4pm! For full details and to RSVP see the Facebook Event Posting here. All are welcome to come out and reminisce about the season gone by and talk smack about the season yet to come! There’s more Rally action all year long! The next event will the BAC RallySprint coming up this July! Keep an eye on the BAC Website and RallyEast for details! Last RallyCross of the season at a special location! We’ve reached the end of the 2016-2017 Bluenose Autosport Club’s RallyCross season and to cap it off we’re headed back to the Conrad Brother’s Quarry in Dartmouth! This amazing facility is used for RallyCross and Rally events through their generous support and this will be an event not to miss! For details see the Event’s Facebook page. Note that this event is NO SPECTATORS due to its location. You must be actively participating in the event to attend. Conrad Bros’ are wonderful to us and the rally community and we have to be on our best behavour! You can still attend by volunteering to help out, contact the organizers!